My wife had already discovered the first part of what I wanted to teach her but there was more than that. When I took martial arts and learned jiujitsu there were two things that I always stuck with me. I learned that balance is broken from the top down and where the head goes the body must follow. One must take a person’s balance at the head or top of the body before you can execute a throw or sweep someone off their feet. It finally dawned on me that in skating the same thing applies! If the upper body balance fails the lower body goes with it. This happens all the time around us and we don’t even know it. If a tree gets too top heavy the weight can make the tree topple over. It lost its balance. If a building leans too much at the top it will fall over. If you’re skating and you roll on a rock or a bead your wheel instantly stops. The first thing that moves is your head in a forward direction (or backwards direction, depending on the way you’re going). Momentum is suddenly stopped at your feet but your head/upper body breaks balance first and then you fall. The rock doesn’t cause you to fall it’s the loss of balance in your upper body that causes you to fall! It’s as simple as that; when your upper body breaks balance, you become unstable or fall. I had really been thinking about what controls balance as I started testing my theories with my wife. I broke down the pieces back to walking. That’s why when I taught her to speed skate, I asked her how do you walk? I wanted to break it down even more simple than that. That’s when I thought about standing on one foot. If I ask the question what’s the first thing that moves when you stand one foot, what would be your answer? In fact go stand on your left foot now. Most people tend to answer their foot but before your foot even moves you have to start to shift your weight to your left side and that starts from the upper body in your left shoulder! Now go stand on your left foot and lift your right leg and concentrate on the feeling in your left shoulder and arm. Make your left arm tense and extend that down your arm to your hand. You’re probably going to start feeling more stable at this point! The free right side is a counter balance check but it doesn’t control the balance! You can freely move the free right arm or leg at any place but as long as you focus your control on your left shoulder/arm you won’t lose balance! Now stand on your left foot and this time force yourself not to shift your weight to your left side. You can’t because you fall over to your right! This major realization is what changed my skating almost overnight. Your balance is actually controlled by your employed side which is either the left and right shoulder of the same foot that you are standing on. It extends down to your arm, to your hand. When you stand on your left foot balance is controlled by the left shoulder. When you stand on your right foot balance is controlled by the right shoulder. Remember how I said balance is broken from the top down. Guess what, balance is also controlled from the top down! I had already started using this principle doing camels, loops, figures, freestyle, etc. Basically everything! Anything I skated on my left foot I put all my focus on the left shoulder, extending down the arm and to the hands. It didn’t matter if I was on an inside or outside edge, forwards or backwards! The left foot balance is controlled by the left shoulder extending down to the arm and hand. Anything I skated on my right foot I put all my focus on the right shoulder, extending down the right arm and to the hands. It didn’t matter if I was on an inside or outside edge, forwards or backwards! The right foot balance is controlled by the right shoulder extending down to the arm hand. When skating on the left foot the right side of the body can literally do anything it wants and be in any position as long as the control focus is on the left shoulder extending down to the arm and vice versa for the right side. Think about it this way If you look at an ice skater that can contort themselves and do spins where they grab their legs they tend to be able to spin in about any position at the drop of a dime. It’s not because just got it one day or they’re super flexible, it’s because they know their balance! I further confirmed this by standing on a foam roller the length of my foot so the roller would roll left to right vs front to back. 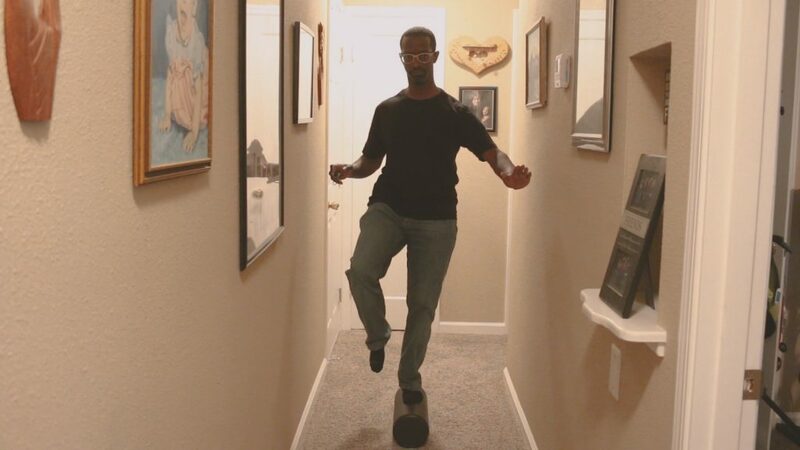 I could actually balance myself on one foot for a good period of time without falling as long as I focused my balance on my left shoulder/arm/hand. I also had my wife try to stand on the roller as well and she was able to balance just as good as me for a length of time even after she had several cocktails earlier in the day. Actually I think we both had cocktails before we did this. You have to understand my wife would have never tried this before because she thought she would have fallen and broken something, but she has gotten so confident doing this that she does this without me being right beside her to catch her if she falls. I often find myself walking around a corner and there she is standing on the roller! I even believe her balance is just a little bit better than mine, especially on my right foot! Balance on the left foot is controlled by the left shoulder (extending down to the left arm to the hand). Balance on the right foot is controlled by the right shoulder (extending down to right arm to the hand). After I had realized that balance controls everything I started to think about how the ankle comes into play. The only purpose of the ankle is stability correction. The control still comes from the top but the ankle will help stabilize or correct your balance if and only if it starts to break. If the ankle can catch broken balance fast enough it can restore control to the upper body. If it doesn’t catch it quick enough the balance is broken and you fall. You do not have to excessively roll or press your ankle to follow for example a left outside edge. In fact you really shouldn’t be moving your ankles much at all! You’re weights shifts to the part of the skate that you need it to but you shouldn’t use your ankles to do it! The more still you can keep your ankle, that’s one less thing that can affect your loss of balance. Think about skiers. They are in very stiff boots to keep their ankles from moving so they don’t break them. They can steer left and right by leaning left or right starting with the shoulder. The edge of the ski grips in the snow allow them to turn. Ice skates work the same way and so do roller skates! Edges don’t matter to a certain extent. I use to think that I had to press an edge with my ankle to get a 3 turn or maintain a trace of a circle but it really just comes back to balance. The same side shoulder of the skating foot controls the balance. It also controls how much lean you make on an edge. If you start think of your edges from the shoulder down then you’ll be surprised how much better you can skate a line or trace a circle. I found this to be particularly true when skating loops! The free side is the counter balance check but the control is in the shoulder of the same side skating foot. At this point I have really taught you everything thing you need to know about skating better. I’ll go more into the details of specifics in upcoming sections but by now your wheels should be turning (pun intended). I’m not discounting anything that I’ve learned and have been told from all my previous coaches and teachers. They were right in everything they told me but it was never told to me the way I’ve figured all of this out. I don’t consider myself a coach either. I’m still teaching myself the balance I need to perform certain techniques but I’m figuring it all out quicker than I ever have before. Skating is really as simple as becoming a master of balance and it doesn’t stop there. Think about other sports like martial arts, gymnastics, boxing… the list goes on and on! I’m now at the point that when I do something wrong I know exactly what I did wrong and on the next try I know what I need to do to fix it. This is what is allowing me to progress faster. I can also now look at a skater and instantly tell if the skater will fail the spin, jump, 3-turn, etc. just by looking at what their shoulders are doing and where they are positioned. It really has nothing to do with their feet and everything to do with their head and shoulders. By all means I’m still not 100% consistent at everything I do and probably never will be but the more I try the better I’m getting each day.